Activists help perplexed new immigrants navigate Israel’s elections system. Tuesday’s elections have seen the highest turnout in over a decade as Israelis are eager to have a say in the next government. New immigrants are excited to vote as well, but often find themselves perplexed by Israel’s system. The Bayit Yehudi (Jewish Home) party’s Yoni Shetbon decided to make it a mission to help new immigrants navigate the system. He and other activists spent the day helping new immigrants from France figure out where and how to cast their ballot. 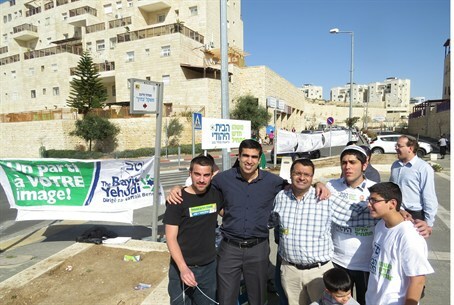 Activists set up camp outside polling stations in Jerusalem, Netanya and other cities with a high number of French-speaking immigrants and made themselves available to answer questions. They also set up a hotline where French immigrants could ask elections-related questions in their mother tongue. Shetbon’s own parents are immigrants from France. He explained that the French-speaking community in particular often has questions because of the differences between the French and Israeli systems of voting. In France, for example, the elections for Parliament and for Prime Minister are separate, he explained, while in Israel they are the same. Israel votes, You Watch. Live from Jerusalem, watch the Arutz Sheva election special sponsored by the Orthodox Union OU Israel Center today, Tuesday January 22nd from 9:00PM - 2:00AM Israel time / 2:00PM - 7:00PM Eastern Standard Time. Your phone calls will be taken. For details click here.